The Women’s Press, London, 2000. Rosalie Bertell’s new book, “Planet Earth the Latest weapon of War”, reveals the unbelievable truth in the new generation of super-weapons. Important books are rare – very rare. “Planet Earth the Latest Weapon of War” is one such rarity. Like Rachel Carson’s Silent Spring it deserves to be read by everyone who cares a jot about their future. For it reveals that, behind carefully spin doctored names like ‘the Star Wars project’, the military is now testing radically new weapons which so profoundly imperil the earth, and all life on it, that to deploy them in the name of security is like suggesting that becoming a suicide-bomber increases life expectancy. —– As a distinguished American scientist, world expert on radiation, and winner of major international awards for science, Dr Bertell is no scaremonger. Yet her cool, incisive, fact-packed, prose not only reveals weapons worthy of science fiction, but shows that testing them may be costing thousands of innocent civilian lives – in peacetime. —– She exposes how the military have, for decades, been secretly conducting experiments, including high-level nuclear explosions, which may disrupt the vital layers of the atmosphere which protect us from the sun’s lethal radiation. She says these experiments are often conducted without even discussing with non-military experts the hazards of damaging these life-preserving earth-veils. And she believes that such experiments may already have accelerated global warming and contributed to earthquakes and freak weather conditions. —– The story unfolds gently. She tells us that, for four years, a Russian thermonuclear bomb a thousand times more powerful than Hiroshima bomb circled above our heads. And that a single rocket launched by the US military merely carried enough plutonium to cause lung cancer in 20 million people – had it exploded like some of its non-loaded predecessors. —– In July 1962 NASA announced that high altitude nuclear tests had created a new radiation belt 750 miles deep, girdling the earth. This damage and pollution was compounded by ‘me too’ experiments by the USSR. Dr Bertell says it was 10 years before American scientists realised that it would be hundreds of years before the vital earth-shielding Van Allen belts of the earth’s atmosphere would recover from such onslaughts. —– However, the repercussions may not be limited to the atmosphere itself. She says that, after one nuclear experiment, which created new electromagnetic belts in the atmosphere, the caribou mysteriously failed to migrate for the first time in 3000 years. A warning perhaps of how the migration of animals, fish and birds may be affected by disturbances to electromagnetic fields – and of the potential impact on man. For, without the caribou, many Inuit people starved to death. Moreover, the nuclear radiation was not confined to the upper atmosphere: caribou and people who survived were dangerously contaminated with caesium 137, and cancer, lung disease and infant mortality soared. —– Despite opposition from the International Union of Astronomers, the US military even put 350,000,000 copper needles into orbit. An experiment which Dr Bertell says some scientist believed may have upset the balance of the planetary magnetic field, causing the massive 8.5 Alaskan earthquake and losing Chile part of its coast. Yet she shows that such experiments are small beer compared with what is being done today – and is to come. —– For example, she describes HAARP (America’s High-frequency Active Auroral Research Programme) a multimillion pound ‘civilian’ installation, hidden away in Alaska, ostensibly intended to ‘alter the performance of communications and surveillance systems’. Seemingly innocent enough, until she explains that this grid of 180 transmission towers is funded by the military and is part of the ‘Star Wars’ defence network. HAARP, and its linked brother projects are, she says, known to the military as ‘ionosphere modification facilities’. For, according to the proposal for its installation, HAARP is intended to trigger and control natural processes in the ionosphere in ways ‘that could be potentially exploited for department of Defence Purposes’. In other words the ionosphere, which shelters the earth, will be used as the barrel of the gun. —–Dr Bertell suggests that so great is the power of such transmitters that even living near them could be dangerous. She quotes a US federal Environmental Impact statement which says that HAARP can ‘raise the internal body temperature of nearby people …(and) detonate aerial munitions, scramble aircraft communications and flight controls’. Even slight increases in body temperature can alter functioning of brain and body and, as she points out, even a small rise in electromagnetic radiation may cause an increase in cataracts and leukaemia and alter brain and body chemistry, blood pressure and heart rates. But such direct harm is the mere tip of the iceberg. —– In one type of experiment these transmission towers will, Dr Bertell reveals, combine to emit a giant beam, of such power that, ‘in a burst lasting more than a few minutes – it will slice through the ionosphere like a microwave knife’ producing a long incision in this vital layer of the atmosphere. However, the main aim of HAARP is, she explains, to heat sections of the ionosphere until they bulge to form a curved ‘lens’ which will ‘reflect’ HAARP’s massive energy beams back to earth to destroy selected targets – presumably without leaving even a trace of what caused the devastation. —– The layers of our atmosphere are so little understood that no one can possibly know the impact of cutting the ionosphere open, or of making it bulge like a lens. Moreover, she points out that scientists have warned that the energy from HAARP may combine with a natural wave frequency with results which are ‘quite disproportionate to the level of input’ – including disrupting the harmony between ‘earth life forms….and….earth’s life support systems’. —– The rings round Saturn are thought to have been caused by a comparable interaction between energy waves. So, the possibility that HAARP, and its confreres, might trigger catastrophic changes to this planet cannot be ruled out. As Dr Bertell explains, everything is connected, ‘everything in our universe is in dynamic equilibrium and this interference (from HAARP) may destabilise a system that has established and maintained its own cycle for millions of years’ – protecting life on earth. —– Nor is that all. Dr Bertell says that both HAARP and installations in Russia – on which America has, remarkably, collaborated – can also create pulsed, extremely low frequency (ELF) waves which have been directed deep into the earth itself, potentially disrupting delicately poised tectonic plates of the earth’s crust, such as those of California’s San Andreas fault. Given the little understood interplay between tectonic plates, volcano’s and the earth’s molten core, to call this playing with fire would be an absurd understatement. —– Nor, it seems are these the only military installations threatening earth’s viability. Dr Bertell tells us that HAARP is just one of a growing chain of astonishingly powerful, and potentially interactive, military installations, using varied types of electromagnetic fields or wavelengths, each with a different ability to affect the earth or its atmosphere. For example, an installation in Alaska will have a magnetic field more than 60,000 times greater than the earth itself. —– To anyone who knows the impact of magnetic fields on the human body the potential risks of such an installation are obvious. Equally, as Dr Bertell points out, the earth’s magnetic field is both produced by electric currents in the earth’s liquid core and interacts with the Van Allen belts of the earth’s atmosphere in ways not yet understood. —– With typical restraint, she chooses not to guesstimate the effect that a magnetic field 60,000 times greater than the earth’s will have on the earth’s core or the atmosphere. Yet she believes that military tests may already have disturbed earth equilibrium. In addition to showing how earlier military tests have massively contributed to ozone depletion and global warming Dr Bertell suggests that some freak weather conditions and ‘natural’ disasters may have been directly caused by testing installations such as HAARP. —– For example, in 1977 a freak storm which devastated a small town in Wisconsin and destroyed 350 hectares of forest, followed hot on the heels of a government ELF wave experiment. While The Bulletin of the Atomic Scientist reported that an ELF wave transmitter lay right in the middle of another storm which brought down 150 – 200 times more rain than normal. 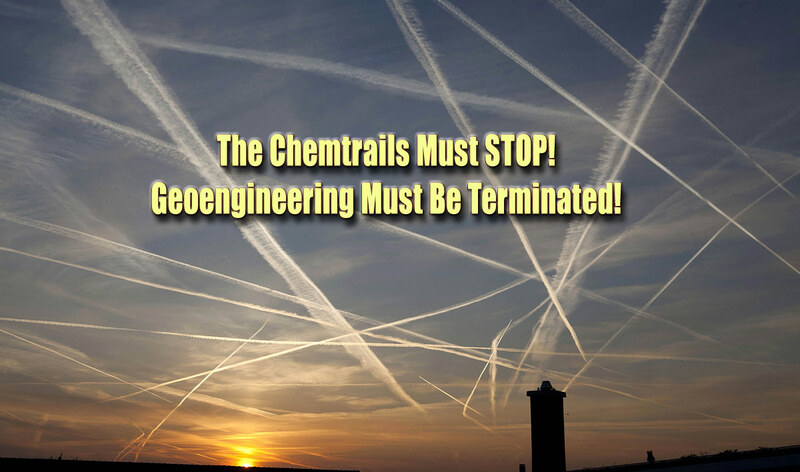 These links are more than purely circumstantial, for she says that weather modification is on the US air force agenda, and in 1992 the Russians told the Wall Street Journal they could already achieve it. And the Wisconsin storm offers what looks very much like direct evidence. —– The question is, does anyone have the wisdom to control weather wisely, and unselfishly? And do they even begin to understand the potential for unexpected side-affects from all these experiments. As she points out, it is since the inception of Star Wars experiments that El Nino has changed its cycle and become far more severe with devastating effects. —– Equally, a Soviet experiment with the ionosphere directly preceded an earthquake in China which killed 650,000 people. While in America ELF – type waves were detected immediately before a San Francisco earthquake in 1989, and unnatural and unexplained low frequency waves were detected before earthquakes in Japan and California in 1989, and before an earthquake in Los Angeles in 1994. We can only wonder whether such ELF waves preceded the recent earthquakes in El Salvador and India this year, and whether the carnage has been caused by ‘security experiments’ by one of the ‘great powers’. —– What is certain, as Dr Bertell shows, is that, globally, the number of earthquakes a year has more than doubled since the inception of military experiments which affect the earth and its atmosphere. Even this could, of course, be mere coincidence but another fact suggests something unusual is going on. Inexplicably, an earthquake in Bolivia in 1994 originated 600km below the earth’s surface – 24 times deeper than normal. —– However, even if no such disasters can be laid at the door of the world’s military, weapons which interfere with the atmosphere violate the 1976 Environment Modification Convention. Yet, she tells us that in January 1991, despite America having signed that convention, the White House waived the requirement for actions by the Pentagon to be assessed for environmental impact. However, America and Russia are not alone in possessing such weapons. Her revelations of 30 years of military innovations show that Britain, Germany and NATO have all been involved in military developments which show a cavalier disregard for life on earth. —– Dr Bertell is perhaps one of the few people in the world who could write this book. As leader of medical commissions to both Bhopal and Chernobyl she is skilled in unearthing facts from beneath mountains of dis-information – accurately scooping the world’s media, on the truth about depleted uranium weapons, by more than a year. As a nun dedicated to serving in the world she does not shrink from the unpopularity accorded a messenger. And her standing as a scientist, personal integrity, and evidence of meticulous research, challenge any yearning to disbelieve her. —– A long-standing opponent of nuclear weapons, she sees today’s military research as a ‘cancer of the body politic’ consuming human, financial, and natural resources which are desperately needed elsewhere. ‘I would liken society’s dependence on the military to a family in which one partner is addicted to something and claims a large proportion of money for feeding the addiction’. As she points out, the billions annexed by defence projects create the very deprivation which eventually fosters war. Moreover, she says military research sequesters many top scientists, ‘This “brain drain” from the civilian economy may be depriving us of those who could resolve the most serious survival problems now facing the biosphere’. —– This is not a comfortable, or easy, book and needs to be chewed slowly, in small helpings. Yet it is well worth chewing and her overall message is one of hope. She says we need to redefine the militaristic word ‘security’ to mean ‘the protection and responsible stewardship of the Earth’ – and redirect former military expenditure towards conflict resolution, social justice and sustainable living. A change which, she believes, can be achieved through active citizenship, global co-operation, information exchange between caring people and organisations, and the kind of peaceful pressure which, in 1996, led to the International Court of Justice declaring the use of nuclear weapons unlawful. —– ‘I hope this book has given readers some inspiration as to how the might become involved in helping this peaceful planet evolve to its full potential. Despite years of abuse, it is still an amazing and beautiful creation. It deserves our best efforts. Enjoy it, love it, and save it’. —– There she is wrong. It is not the planet which may die: it is us. It is ourselves we must love enough to cherish the miraculous web of life which radiates from the earth’s core to the farthest limits of our universe.